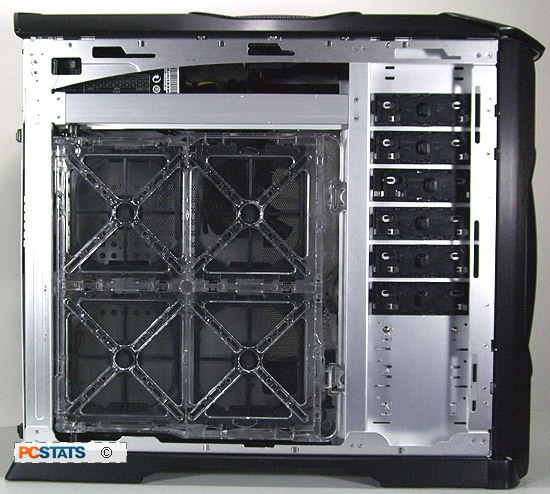 Both side panels have air vents which allow air to move in and out of the STacker 830 SE case easily. As mentioned earlier, the lack of screws to hold the side panels in place can be somewhat annoying while transporting the system around. However, removing the side panels is easy when you need to get at your hardware. The panels pull off towards the back, rather than swinging out to the sides. The Cooler Master Stacker 830 SE has quite a large "stance" and is very stable when placed on a table. If you want your case to have a bit of mobility (like if it were on the floor) Cooler Master supplies four wheels and the necessary mounting screws to attach them. Note there are no locks or breaks on the wheels so make sure you put the case on a flat surface. Add the wheels to the bottom of the Stacker 830 SE - it helps make this massive and heavy case easier to move around. 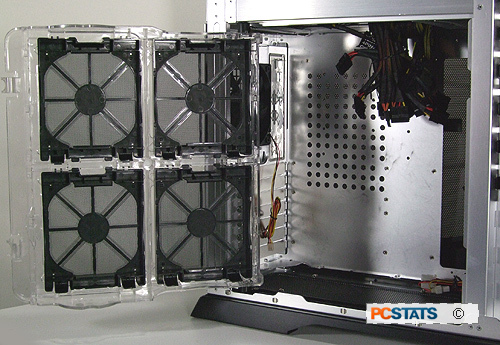 On the left side of the case is a sliding cage which can hold four 120mm fans. Whether you want them to act as intake, exhaust or a combination of those two it's up to you, or if you want to remove the tray all together you can also do that. If you had a large enough heatsink, you could probably do away with a fan and rely on the larger 120mm fans to keep your processor and other system components cool. The Cooler Master Stacker 830 SE is compatible with water cooling, though a system isn't supplied. On the back you'll find two rubber pass through ports. Each hole has an OD of 18mm or 3/4", that may be a bit tight if you're using 1/2" ID watercooling gear, it would have been nice if Cooler Master could have made the pass through holes a full inch in diameter. 0.75" diameter rubber pass-throughs for water cooling tubes to pass through. 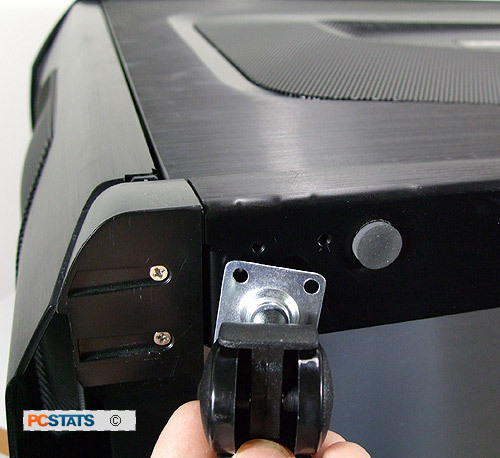 Thumbscrews on the PCI bay covers are easy to access, and hold devices in place firmly. The rear motherboard I/O shied is replaceable, so the custom I/O shields that come with motherboards can quickly be popped in place. 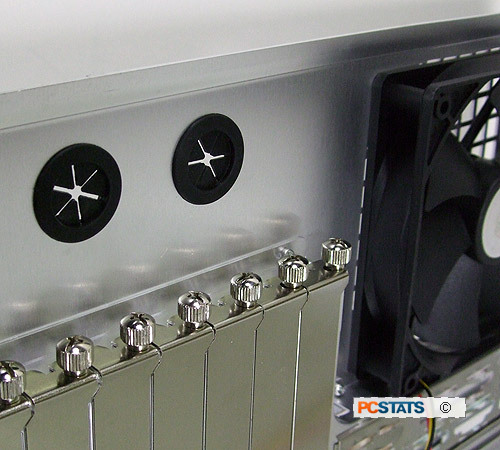 Likewise, the Cooler Master Stacker 830 SE accomodates standard power supplies, and hot swapping redundant units. The inner mounting plate is removed for the latter variety of power supply.